Data loss happens in all kinds of situations such as hard drive failures, virus attacks, file system crashes, unexpected power outage, and even natural disasters. QSAN provides array-based Storage Disaster Recovery Solution that includes writeable snapshots with VSS support, volume cloning, and remote replication. The storage planning varies with the main purpose of the data volumes. When a data volume is simply a backup for temporary data, a quick snapshot setup would be enough. But if a data volume contains important data such as contract records, purchase orders, or itself is a online database storage and cannot accept any downtime, the data volume’s recovery plan should include multiple, local, and remote site backups. The local backup can minimize the recovery time and the remote site backup is perfect for immediate replacement for the original data volume. The remote site backup also gives IT administrators more time to figure out and resolve the issues of the original data volume. When a natural disaster happens, the recovery may take longer than expected which may involve rebuilding new data center. QSAN Backup and Disaster Recovery Solution contains built-in writeable snapshot with VSS support, volume cloning, and remote replication. QSAN remote replication is well programmed with multiple features activating in the same time. It supports up to 32 data volumes per system for replicating. Each data volume can be setup manually or with schedule. The transmitting throughput is guaranteed with dedicated port support per RAID controller and protected with failover mechanism. Each source storage system can be a destination storage system to backup other storage systems in the same time. This feature is designed to fit any storage planning and circumstances. And when the private line has some problems or the traffic is jammed, the schedule tasks retry and restart in well-defined topology all the time. When there is a large amount of data to be replicating, the task is able to automatically start the transmitting when reaching the anteriorly configured threshold value. The automatic synchronization mechanism can avoid too many data waiting to be replicated, and reduce the chance that the private line bandwidth may not be able to digest the amount of data in time before next task starts. A storage plan with multiple backup solutions is suggested to reduce and minimize the data lost chance. 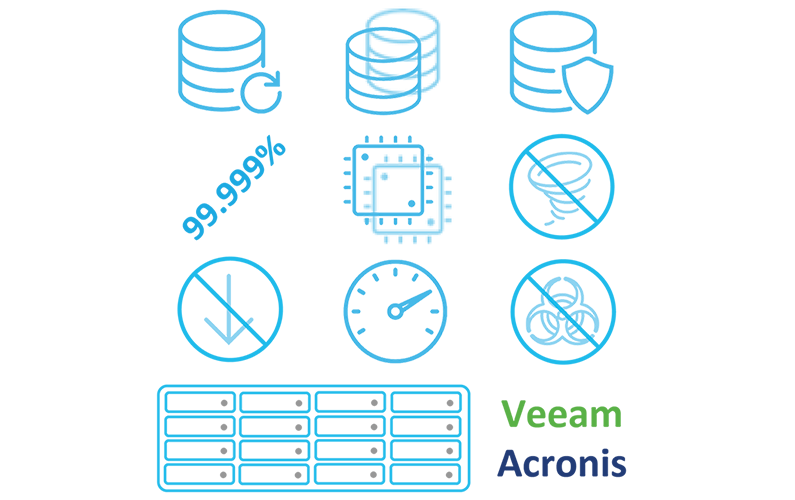 The well-configured local backup solution can resolve hard driver failures, virus attack, and file system crash in a very short time and bring the service back online immediately. With remote replication installed, it can bypass unknown outages and data loss from disasters, and the IT administrators can use the remote backup data volume for temporary service or direct replacement. In the same time, the original site can have more time to be rebuilt without service interruption. Consider a company having several branches or datacenters over separated locations. The data safety can be increased by those branches have data volume backup remotely. 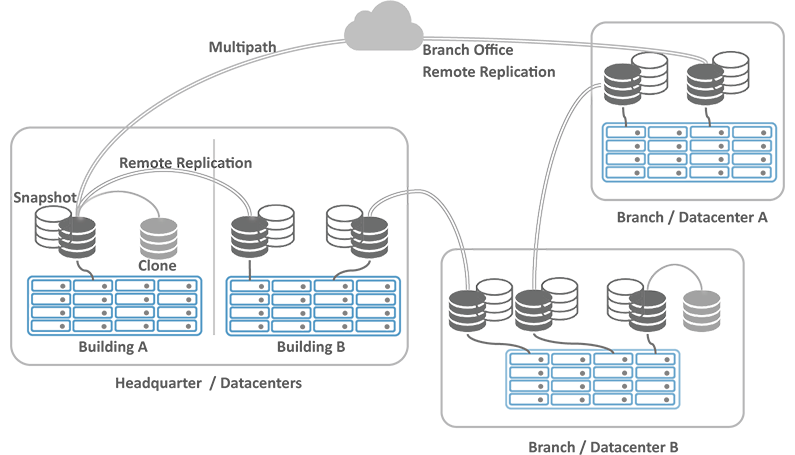 The following figure illustrates a typical branch office model and the storage systems in the headquarters and branches have data volumes with backup remotely in other office. The following table illustrates QSAN’s installation suggestions for different applications to comply their availability rates of data volumes. 2 When using large capacity SATA hard drives (>=500GB) for building RAID volume, QSAN suggests using RAID 6 or SAS hard drives to reduce failure rate. Single SATA hard drive BER (Bit Error Ratio) is around 1 out of 10^14 and the AFR (Annual Failure Rate) is depending on the hard drive type (desktop or enterprise), when a RAID 5 volume is built with 8 x 1TB enterprise SATA hard drives (AFR=0.0075), the error rate of 1 hard drive rebuilding is 56% which is too risky. And the error rate increases with larger hard drives.